Marc Marquez took his fourth consecutive Texan Grand Prix with a dominant display at the Circuit of the Americas. The Spaniard led the race from start to finish, with Jorge Lorenzo and Andrea Iannone completing the podium. Valentino Rossi crashed out on lap three after he had slipped back from his front row start and was battling with Aleix Espargaro. Andrea Dovizioso will be wondering who he has upset, as for the second race in a row he was taken out. This time, Dani Pedrosa was unable to stop his Honda at turn one, skipping his bike in to the side of the Ducati rider. Dovi had been in third at the time, and this incident left the final podium place open for his team mate, Andrea Iannone. Maverick Vinales overcame a tough battle with his Suzuki team mate to take fourth, whilst Scott Redding saw off fellow Brits Cal Crutchlow and Bradley Smith, who both crashed out within seconds of each other on lap eight. Michele Pirro, riding in place of the injured Danilo Petrucci, finished eighth, with Hector Barbera and Stefan Bradl rounding off the top ten. In Moto2, Alex Rins dominated the race, whilst Sam Lowes’ second place takes him top of the championship. The Moto3 race saw Romano Fenati come out on top. Marc Marquez eased to his first victory of the season in an action-packed Argentinian Grand Prix. The race saw an incredible eight non-finishers, including a controversial last lap clash between the Ducati team mates. Teams were forced to make a pit-stop during the race for safety reasons, after Scott Redding’s tyre failed during FP3, and things were made even more unpredictable with a drying track littered with damp patches. Marquez took the lead early on, and he enjoyed a earl tussle with Valentino Rossi before pitting. But the Spaniard switched bikes quicker and managed to get out of pit lane with Tito Rabat between him and Rossi. Marquez took advantage of this breathing room, arguably getting even more out of his second bike to extend the lead to 7 seconds as he took the chequered flag. Valentino Rossi fell back, battling first with Maverick Vinales and then with both of the Ducatis. Vinales passed Rossi but crashed out on turn 1 with two laps to go. Andrea Iannone looked to have got the better of his team mate, tussling with Rossi for second position. However, Dovizioso mugged the pair of them to move in to second. But on the penultimate corner, Iannone dived for a gap that wasn’t there, lost the front end and took out his team mate, gifting Rossi second place. 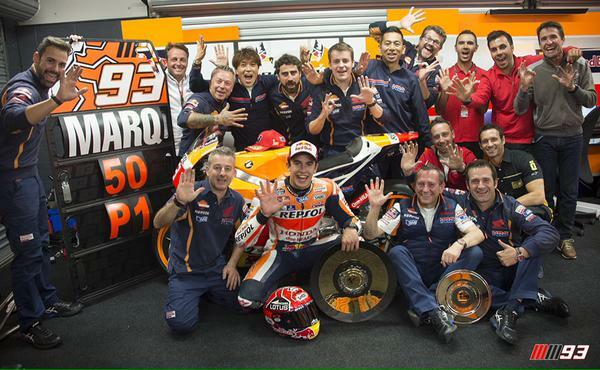 Dani Pedrosa claimed third, 28 seconds behind Marquez, with Eugene Laverty coming fourth. Hector Barbera edged out Pol Espargaro for fifth, whilst Stefan Bradl and Bradley Smith rounded off the top 8. Jorge Lorenzo was unable to follow up his victory in Qatar as he slipped off early on. He was not having a good race anyway, only seventh after Jack Miller crashed out on lap four. Scott Redding continued his unlucky weekend as his bike broke down whilst in sixth, ahead of Dani Pedrosa. Cal Crutchlow crashed out on the final lap. Johann Zarco took the victory in Moto2, with Britain’s Sam Lowes profiting from a crash to finish second. Danny Kent missed out on the points finishing 16th. Rookie Khairul Idham Pawi won the Moto3 race, becoming the first ever Malaysian Grand Prix winner. Marc Marquez finished the Australian Grand Prix for the first time in some style, producing a masterful final lap to take the victory. 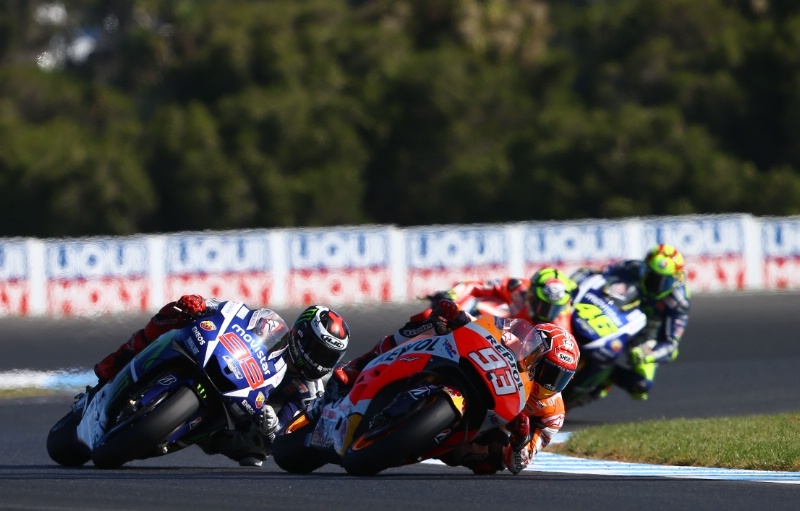 The Spaniard went in to the last lap in fourth, but produced a lap record to pip title hopeful Jorge Lorenzo to the win. Andrea Iannone completed the podium after winning out over title leader Valentino Rossi. Although Marquez started on pole, it was Lorenzo that set the early pace.It soon began to develop in to a four way race, with the leaders interchanging throughout. Marquez passed Lorenzo through Honda corner, and the number 99 almost slipped another place, but Iannone ran wide after blasting past on the home straight. The reigning champion was unable to escape his fellow leaders though, with Lorenzo passing him, then Rossi and Iannone both lunging down his inside on the same corner. On the final lap, Marquez passed Rossi at the beginning of the lap, before passing Iannone at Doohan. The Italian fought straight back but in doing so left the door open for Marquez to slip straight past him. As Marquez chased down Lorenzo, Rossi slipped up the inside of Iannone, just doing enough to prevent the Ducati man from biting straight back. Marquez made his move with just two corners left, holding a tight line through the hairpin. Luckily for Lorenzo, Iannone also passed Rossi at the same corner, meaning that the Spaniard’s championship hopes are still alive. Dani Pedrosa finished fifth, with Maverick Vinales sixth and Cal Crutchlow finishing as the top Brit in seventh. Bradley Smith continued his run of scoring points in every race this season with a tenth, just ahead of Scott Redding. Jack Miller was the top Open class rider in fifteenth. With those 20 points, Jorge Lorenzo has now cut Valentino Rossi’s championship lead to just 11 points with two races remaining. The win for Marquez all but secures his third place, whilst Bradley Smith is still within touching distance of fifth placed Dani Pedrosa despite his tenth place at Phillip Island. In Moto3, Danny Kent will have to wait to seal his title after he was taken out in spectacular fashion by his main title rival Enea Bastianini. Miguel Oliveira won the race to leapfrog Bastianini in the championship, 40 points behind Kent. It seemed almost inevitable that things would not go for the Brit this weekend, having been relegated to seventh from pole for slow riding in the warm-up, and being clipped already by Francesco Bagnaia before Bastianini ended his race. Alex Rins was the clear winner in Moto2, with Brit Sam Lowes keeping his hopes of reaching third in the championship alive with a second place.